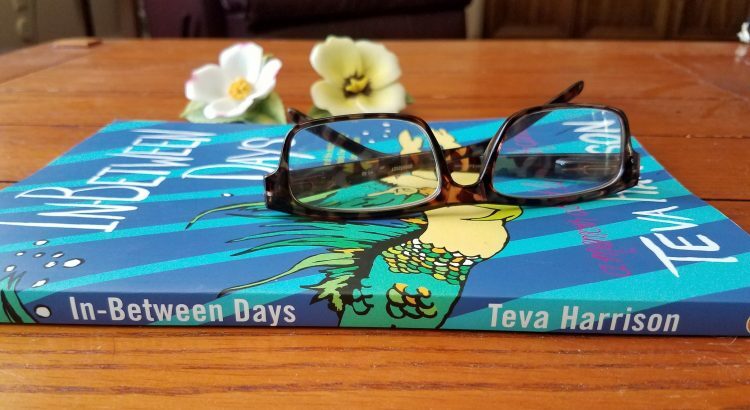 “In-Between Days” by Teva Harrison, A Book Review & Giveaway! Frequently, I am contacted to write book reviews. Sometimes I say, yes. Usually I decline. Now and then I decide to write one even when no one has asked me to. This is one of those times. 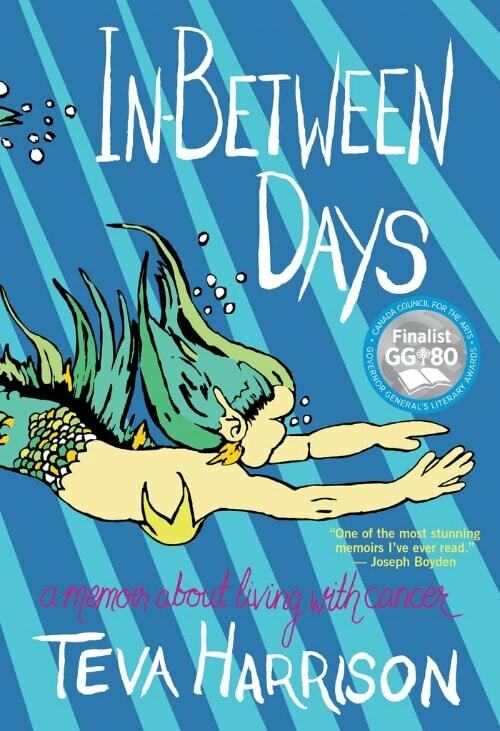 The complete title of the book featured in this post is: In-Between Days – a memoir about living with cancer by Teva Harrison, published in Canada in 2016 by House of Anansi Press Inc, 163 pages, illustrated memoir. You know how some books just feel inviting when you first pick them up? This is one of those books. Larger in size than the ordinary paperback, In-Between Days is a combination of comic illustrations and short personal essays, both depicting in equally stunning ways what it means to the author to live with metastatic breast cancer. Teva Harrison was diagnosed with metastatic breast cancer at age 37. It’s worst when I can’t sleep. That’s when all my demon thoughts come to the surface. They love the dark. They swirl before my open eyes and blinking doesn’t dim them. Who doesn’t relate to that? In-Between Days gives readers a look into what living with a terminal disease is like for her. Harrison doesn’t sugarcoat; this alone makes it worth a read. Despite Harrison’s candor, no, because of her candor, the book is inspirational and difficult to put down. Because truth always inspires. As does love. And In-Between Days is also a love story. Harrison shares about her relationship with her beloved husband David. Their love literally holds her up when in her words, she “sometimes breaks”. Readers will take note of her deep love for family and friends as well. Harrison also shares about the hereditary component to her cancer story something that resonates deeply with family’s like mine. Since there’s no way out for me, I hope I am the end of the line for cancer in my family. There’s a beauty and poignancy to Harrison’s words and drawings. You’ll quickly be drawn in by both. One of my favorite essays is, Cancer Fraud. We are all well aware that looks can be deceiving, but when you’re metastatic and appear “normal” from the outside, it can be difficult for others to even begin to grasp the magnitude of what is really happening on the inside. As someone who tends to be too wordy at times, I was struck by the minimalist approach Harrison has taken with her essays. Her words are carefully chosen – to the point, honest, descriptive, deeply personal and perfectly expressed. Hope is a dangerous thing. It’s absolutely crucial all the time, or I couldn’t go on…But I can’t put too much hope in any one thing. Especially now. In one moment anything can change…Hope is delicious, heady stuff, but reality has a way of upsetting the applecart. I have to find a way to balance the hope I need to get up every day with the pragmatism I need to deal with bad news. In the metastatic breast cancer community there is often discussion, frustration and even anger that their voices are not being heard. This book is one woman’s experience and yet through sharing her story, Harrison sheds light on what it is like for others living with metastatic breast cancer or other serious illnesses. She also shines light on the difficult, vital roles loving caregivers and other supporters play in the day-to-day lives of people living with serious illness. I hope that by talking about the hard stuff, I am helping other people who are living with cancer or other serious illness (and their caregivers and supporters) to start conversations with peers and professionals, with their friends and family, and with their doctors. I’m quite sure in this she has succeeded. If you are living with metastatic disease, you will feel as if you have another friend who understands. If you’ve ever wondered what it must be like for someone living with a terminal illness (and we all should be), read this book, and then share it with someone else. Learning and talking about the hard stuff is something we should all be doing. In-Between Days is the perfect book to help get those difficult conversations started. 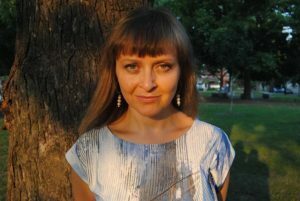 Teva Harrison is a writer, artist and cartoonist. Her graphic series on living with cancer is published by The Walrus. In-Between Days was a finalist for the Governor General’s Literary Award for Non-Fiction in 2016, and Harrison recently received the The Kobo Emerging Writer Prize for Nonfiction as well. She lives in Toronto with her beloved husband David. If you would like to win a FREE copy of In-Between Days, share a comment below by 5 p.m. on Monday July 10, CDT, and you’ll be entered in my drawing. A winner will be announced here on this post shortly thereafter. A USA mailing address is required this time. The winner of the blog giveaway is Becky! The winner of my newsletter giveaway is Carol! Congrats to both winners! Sign up for weekly updates from Nancy’s Point here! The author has such strength. I would love to read her story. As I begin chemo in three weeks, I think this would be a great read. Just that small expert and I am attracted to her writing. Lovely style. Thank you for the direction toward a good read. Memoir is my favorite genre as well. “In Between Days” sounds like a riveting read, one that I would be unable to put down until I finished reading it. Thanks so much for this review! I would love to read her story, I can tell she is a powerful writer. I think it might be a hard read, but it sounds really interesting. I too am a huge fan of memoir as a genre. I haven’t read too many breast cancer memoirs yet. I’m particularly interest in the different ways people chose to use to tell their stories. I would absolutely love a copy of your book. I live in Iowa. Thank you for the chance to win!! Thank you for your review. This book definitely sounds like a must-read! Loved this book! Made sure my bff Denise got it from the Library to help her along in her journey. I would LOVE for her to have her very own copy! I’m looking forward to reading Teva’s memoir. Some find it depressing to read about MBC, but I find it reminds me of why I advocate. I am currently NED but live with the daily thought of reoccurrence. Looking forward to reading this book. Her words about hope . . . so moving. Count me in! I snapped this book up as soon as I saw it (and now I can’t remember where that was). I wanted it for three reasons: I also was a professional designer, I am a budding writer, and I have metastatic kidney cancer. Her format of an illustration on one page and brief text on the facing page is the perfect mix. Sometimes an illustration can communicate far better than words. I read her book very quickly (couldn’t put it down) but have since revisited it many times, especially on really dark days. Even though her book isn’t a “ra-ra, stay positive all the time” book, it’s nice to know someone is feeling exactly as you are. One of my friends saw it on my coffee table, borrowed it and liked it, and she doesn’t even have cancer. She’s completely honest in her book—she acknowledges the terminal nature of her illness, but also holds out hope and is currently in a clinical trial. I really am pulling for her—I feel especially sad for women who have been stricken with this disease at such a young age. At least I was 60 when I was diagnosed. So, if you’re looking for a refreshing take on metastatic cancer, this is a good choice! I am looking forward to reading this book. As a nurse and a breast cancer survivor, 2 points in your review resonated with me. One-you may look fine on the outside, but inside can be a whole other story. Two-have those conversations with your family at all ages. I’ve seen too many families where this did not happen until a time of crisis and the results can be very painful. I’d love to read it! Since my diagnosis, I’ve had three people in my life also diagnosed with breast cancer. Reading this book would give me greater insight. I was diagnosed metastatic in august 2016. 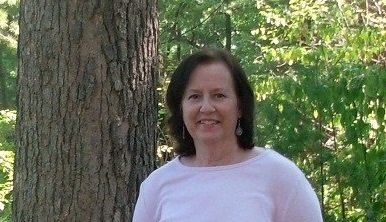 My 3e time with breast cancer. it’s been a long road and i would love to read her book! I’m currently dealing with how to balance hope and reality. It’s nice knowing i’m not alone. The title reminds of My Many Colored Days by Dr. Seuss. Even though I’m an early-stage patient, I try to learn all I can about MBC so I can better advocate for this niche of patients who lose their voices much to early. I am probably a little late, but would love to read this book. I always appreciate how others share their story, especially on a topic I relate to. I’m late to the give-a-way, but I think I’ll search this book out. It sounds amazing. Beth, It’s a wonderful book. I highly recommend it. What Should You Take to Chemo?